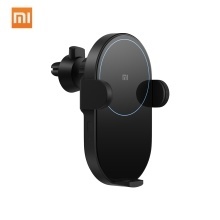 Original Xiaomi Wireless Car Charger 20W Max Electric Auto Pinch 2.5D Glass Ring Lit For Mi 9 (20W) MIX 2S / 3 (10W) Qi 20W Max Strong Power Wireless Charging,It can make the Xiaomi 9 power quickly return from 0 to 45% in half an hour, fully charged in 90 minutes. Inductive Electric Clamp Arm Securely Locked,With a built-in hidden infrared sensor, the arm will automatically expand and lock when the phone is put in. It has a multi-angle free adjustment to fix the phone according to your habits. This is Xiaomi Wireless Car Charger 20W, which gives Mi 9 Cellphone a max 20W charging rate, and gives MIX 2S and MIX 3 a max 10W charging rate, gives other Qi EPP compatible cellphones a 5W charging rate. The bundle includes a wireless car charger, a cable and a car charger. To use the wireless charger, the cellphone case can neither be of metal nor thicker than 4mm. 20W max quick charging. Dual cooling multiple safety. 81.5mm width for most devices. Gifts Cable and USB Car Charger. 2.5D glass with blue ring light.